The picture is indeed of a whale with two heads, but more precisely, it is the world's first documented case of Siamese twin grey whales. The 4 metres carcass was found washed ashore in a Mexican lagoon surprised locals when it was found they were conjoined. 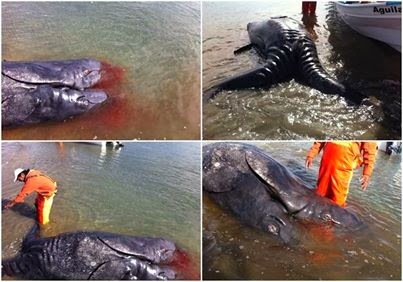 Biologist Benito Bermudez says the whales were found alive in the Ojo de Liebre lagoon in the Baja California Peninsula but lived only a few hours. Bermudez said Wednesday they were linked at the waist, with two full heads and tail fins. Bermudez is a marine biologist with the National Natural Protected Areas Commission, or CONANP. He said scientists are collecting skin, muscle and baleen samples to study the creatures. Every year more than 20,000 gray whales swim to Mexico from Alaska to mate and give birth.